It's hard to get excited about forgeries of Dashnak Armenian stamps. They were produced on an industrial scale - and no doubt there is someone still producing them. You don't need more than kindergarten skills. Many forgeries were probably produced by people who did not possess genuine examples and had only seen pictures. Some forgeries were produced by people copying forgeries which they may have thought to be genuine examples - for Dashnak overprints they may have put their trust in the illustrations of Yvert et Tellier, all of which are (or were - I last looked a few years ago) copied from forgeries. Over the decades, Yvert probably did more harm to Armenian philately than any other catalogue. The forger who produced the small multiples shown above had almost certainly seen genuine stamps since he (it's normally he) has copied a feature you see on genuine sheets - the post office clerk testing out his (then it was always his) handstamp in the sheet margin. As forgeries, these are consequently Above Average. The 10r on 25 kopeck imperforate forgery is interesting. This is a stamp which I think exists in genuine state, but it's rare - the 25 kop was not a common stamp imperforate and it would probably only have reached Armenia in the first Bolshevik period (end 1920 - beginning 1921) and would then have been used by Melik-Pachaev to produce scarce philatelic varieties in the second Dashnak period of 1921. Though basic stamps and Dashnak overprints are combined in a myriad of ways, many of the permutations the inspired work of dealers and speculators, there is one area where some kind of discipline was maintained. This is the case for high value overprints (50 rouble and 100 rouble) on rouble value basic stamps. The 50 r overprint was normally applied to the 1 rouble stamp and the 100 rouble overprint to the other high value stamps (3r 50, 5r, 7r, 10r). Though genuine 100r overprints can be found on the 1 rouble, 50 rouble overprints do not appear to exist on the higher value stamps. 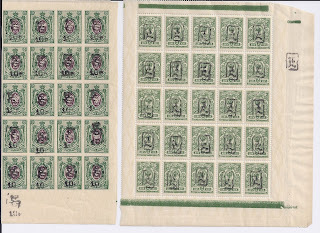 Some 5r stamps exist overprinted 25r - and then corrected to 100r. So it appears that either a ruling by the post office or the economics of the situation meant that no one got hold of surcharges below 100r on stamps above 1 rouble It's curious but seems to be true. But spaces for lower value surcharges on higher value stamps found their way into old French album pages and forgers obliged with stamps to fit. Or vice versa: the album pages were designed for the forgeries. Below I show an old album page, given to me at the Paris Salon d'Automne with spaces for 50 r surcharges on imperforate 3r50 and 5r stamps (#73, 74). 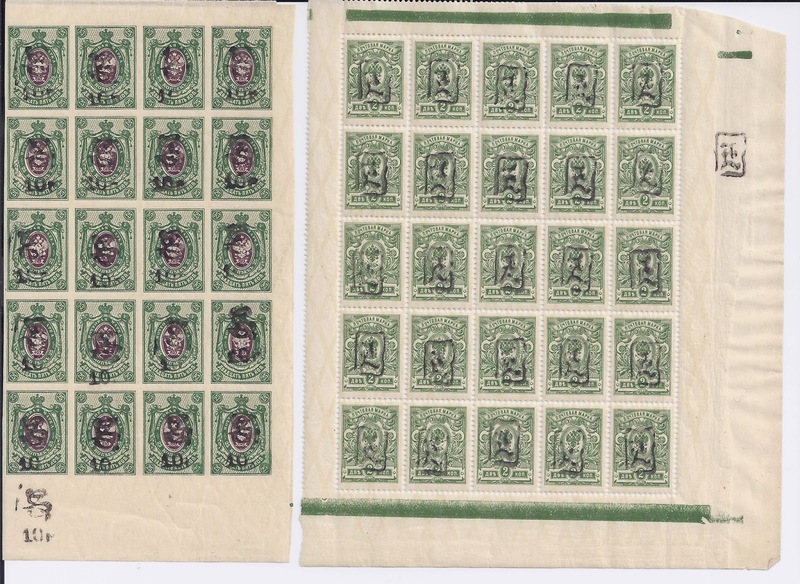 And I also show a block of 50r on 5r forgeries from an old dealer's stock which I bought at auction many years ago in Paris's rue Druout stamp trade district. I think it's a chicken and egg situation: did the album page come first or the forgery?